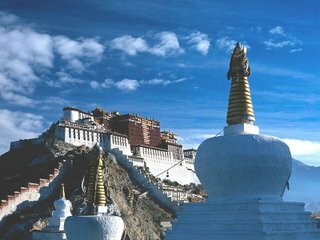 Originally built by King Songtsen Gampo in the seventh century, Potala Palace is located on the Red Hill of Lhasa, Tibet. 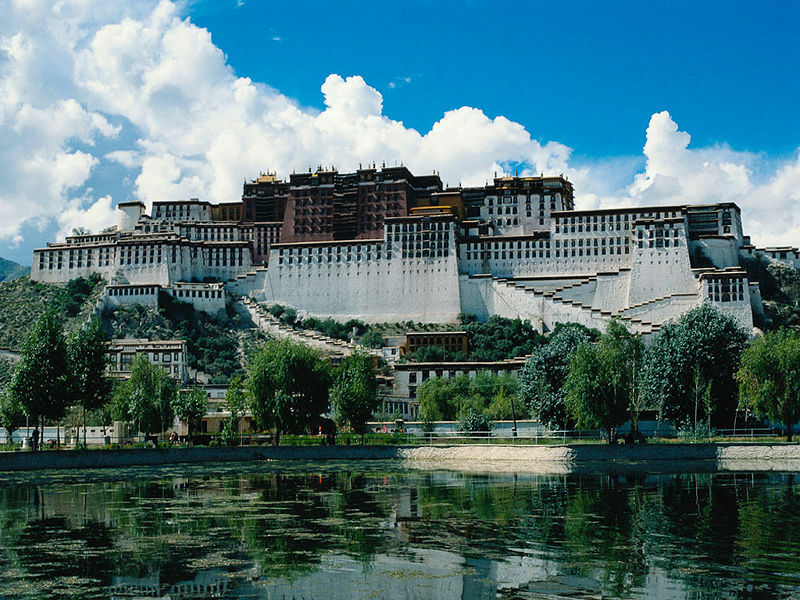 Destroyed by lightning and war, Potala Palace had been rebuilt by the Fifth Dalai Lama in 1645. Since then, Potala Palace has become the seat of Dalai Lamas and also the political center of Tibet. The thirteenth Dalai Lama extended it to the present size, 117 meters (384 ft) in height and 360 meters (1,180 ft) in width, covering an area of more than 130, 000 sq meters (about 32 acres). Mainly comprised by the White Palace (administerial building) and the Red Palace (religious building), Potala Palace is famous for its grand buildings, complicated constructions, devotional atmosphere and splendid artworks. Upon entering the East Portal, visitors will come into the Deyang Shar courtyard where Dalai Lamas watched Tibetan opera. West of the courtyard is the White Palace. As the winter palace of Dalai Lamas, the White Palace is a seven-floor building originally built in 1645. The wall of the palace was painted to white to convey peace and quiet. The Great East Hall on the fourth floor is the largest hall in White Palace, occupying a space of 717 sq meters (about 7,718 sq ft). This hall was also the site for holding momentous religious and political events. The living quarters and offices of regents are on the fifth and sixth floors and while the top floor consists of the East Chamber of Sunshine and the West Chamber of Sunshine. Because of the sunshine in the chambers all year round, the East and West Chamber were the places where Dalai Lamas lived, worked and studied. The furnishings are sumptuousness and comfortable, revealing the dignity of Dalai Lamas. Standing on the spacious balcony, visitors can look down on beautiful Lhasa.